These cooling and refreshing beverages will help you better enjoy your vacation out to Southeast Asia. It's summer in Southeast Asia and everyone seems to be reaching for a cold drink these days. It's not surprising because summer in Southeast Asia can get extremely hot and humid. 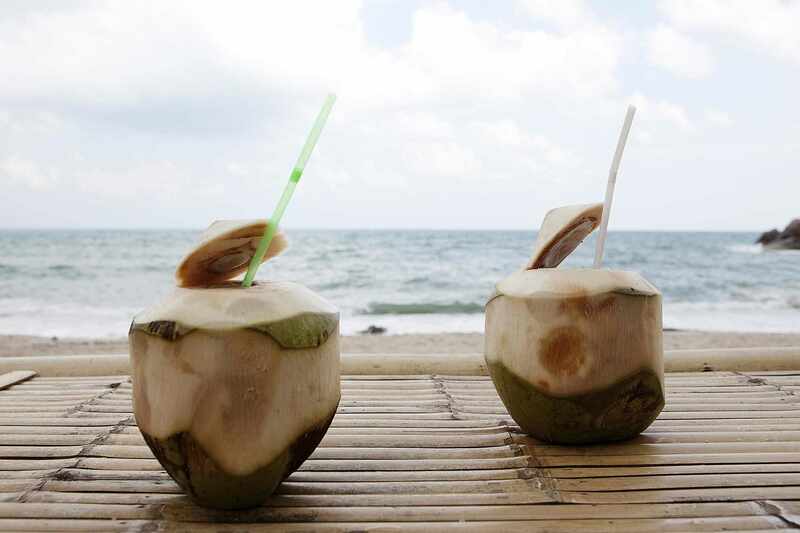 Nothing quenches parched mouths and throats better than coconut water. Just chop off the top of a young coconut to expose the flesh, cut through the flesh to insert a straw and enjoy. Because the coconut water is insulated by the thick walls of the coconut shell, the water is always cool. Citrus fruits are squeezed to make tangy cold drinks. Lime is popular in Vietnam where lime juice is sometimes mixed with simple syrup and soda water to make limeade soda (soda chanh). Kalamansi is more widely used in the Philippines and Indonesia. Other citrus-based drinks are made with the juice of pomelo and grapefruit. In the Philippines, the seaweed-based gulaman is the equivalent of the Western animal-based gelatin. Sago may mean sago pearls which come from a variety of palm tree or tapioca pearls which, as the name says, come from tapioca which is a starch derived from cassava. Tapioca peals are more commonly used these days. To make the basic gulaman at sago drink, iced water is sweetened with palm sugar syrup then the cut gulaman and cooked sago are stirred in (see recipe for Pandan-flavored Tapioca Pearls in Palm Sugar Syrup). A very popular variant in Thailand, Vietnam, Malaysia, Singapore and Indonesia is a drink made with grass jelly (made from stalks of mesona chinensis) and sugar syrup. Iced tea may be made with real tea or herbs, and sometimes flavored with fruit peel and / or spices. Iced teas that are not made with real tea are, strictly speaking, infusions but are often referred to as "tea" prefixed with its main ingredient such as "lemongrass tea" as "mint tea". Whether made with real tea leaves or herbs, iced tea is very popular all over Southeast Asia. They are a staple in food stalls as well as in high-end restaurants. Despite its name, the drink did not originate from the Indonesian city of Bandung. A drink popular in Malaysia and Singapore, bandung is a mixture of milk and rose cordial syrup. When cubed grass jelly is added, the drink is called bandung cincau. Sold on demand, street vendors in Indonesia, Vietnam, and Malaysia squeeze fresh sugarcane juice from portable presses that they carry in their stall. In Singapore, you'll find sugar cane juice in food courts. Contrary to first impressions, sugarcane juice is not cloyingly sweet because it is diluted with ice and the sweetness is balanced with a squeeze of citrus juice. While Southeast Asian summers can be withering, the upside is that fruits are abundant during the season. Mangoes, melons, watermelons, pineapples, papayas and a host of fleshy fruits are pureed, sweetened and iced to make the most delectable tropical drinks. It's impossible to talk about iced tea without talking about bubble tea. Although it originated from Taiwan, bubble tea has found its way to Southeast Asia where it was embraced with enthusiasm. What is bubble tea? Bubble tea (also known as pearl milk tea or boba milk tea) is a cold thick iced drink made by shaking a tea-based solution with milk, fruits or both then served with chewy tapioca pearls. Cendol is often defined in the English-speaking parts of the world as a dessert made with "worm" jelly, coconut milk, ice and sugar. But cendol is also served as a sweet cold drink. In that context, the Javanese definition of cendol -- the "worm" jelly made with rice flour paste pressed through a sieve rather than the dessert or the drink -- makes more sense. Variants of cendol dessert and drinks are found in Indonesia, Malaysia, Singapore, Thailand, Vietnam and Cambodia. No, Starbucks did not invent iced coffee. The Algerian mezagran, a cold and sweetened coffee drink, has been around since the first half of the 1800's. In Vietnam, ground coffee is measured into a special press, moistened with hot water then pressed directly into a cup. It is mixed with sweetened condensed milk then poured into an ice-filled glass.